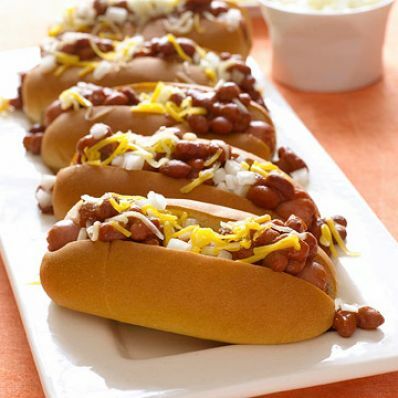 This recipe for grilled hot dogs topped with a spicy chili sauce and Mexican-cheese blend is sure to be a family hit. 1 of 3 In medium-size saucepan, combine beans, tomato sauce, sugar, chili powder, cumin and oregano. Simmer on medium heat for 5 minutes, stirring. 2 of 3 Spray a stovetop grill pan or skillet with nonstick cooking spray and heat over medium-high heat. Grill hot dogs for about 5 minutes, turning halfway. 3 of 3 To serve, place hot dogs in rolls. Spoon chili over the top of each. Sprinkle each with 1 tablespoon of the cheese and some of the chopped onion.